Each year in December, Kalamazoo Bicycle Club (KBC) members are invited to vote for the annual Friend of Bicycling Award recipient from a list of nominees. The 2019 Friend of Bicycling Award went to John Dunlop and the Portage Central Middle School’s Ride for Focus Program, which won by an overwhelming margin. Through the Ride for Focus Program, Mr. Dunlop, along with the support of other school staff members, has exposed more than 700 students to the sport of cycling. John has also offered bike-handling clinics for parents and staff of the school, many of whom now share a love for bicycling. 2019 Friend of Bicycling Award presented to PCMS staff member John Dunlop (center) by KBC President Doug Kirk (left) and KBC Awards Committee Chair Pam Sotherland (right). Photo by Zolton Cohen. 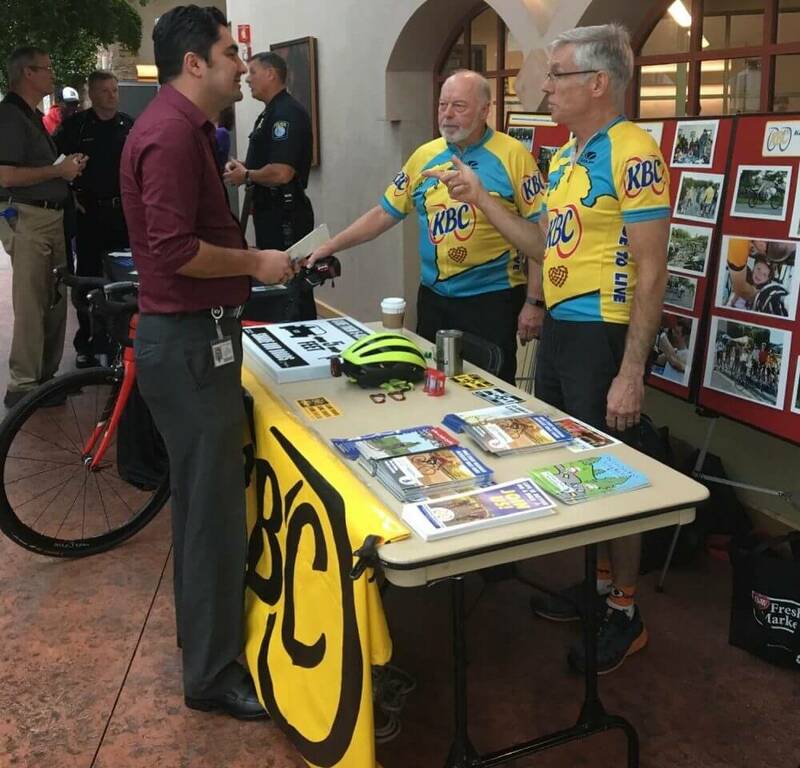 KBC’s Friend of Bicycling Award goes to an individual, organization, or other entity who has significantly advanced the interests of bicycling. 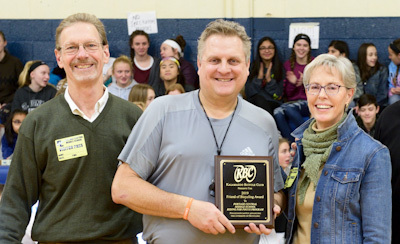 This year’s award was presented to Mr. Dunlop at an all-school assembly in late January by KBC President Doug Kirk, Vice President Paul Sotherland, along with KBC members Kathy Kirk, Pam Sotherland and Zolton Cohen. Okay…we’ve barely said good-bye to Daylight Savings time (and to what’s left of the 2018 riding season) and we’re already thinking about Recovery Party time. Yes, the 2019 KBC Recovery Party will land on the last Saturday in January as always (January 26, 2019 from 7:00-10:00 pm). But, our usual venue will not be available for our gathering this year. 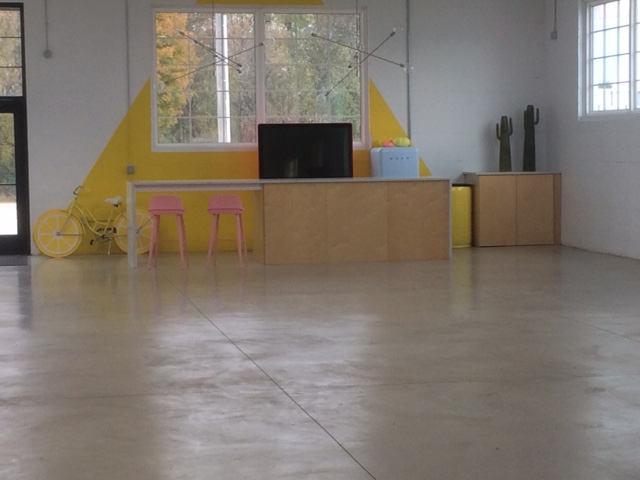 So, thanks to Jamie and Windy Clark, we’re having the 2019 Recovery Party at the Clark Logic event facility, 555 Eliza St (W Avenue) in Schoolcraft, just 5 blocks east of US 131. 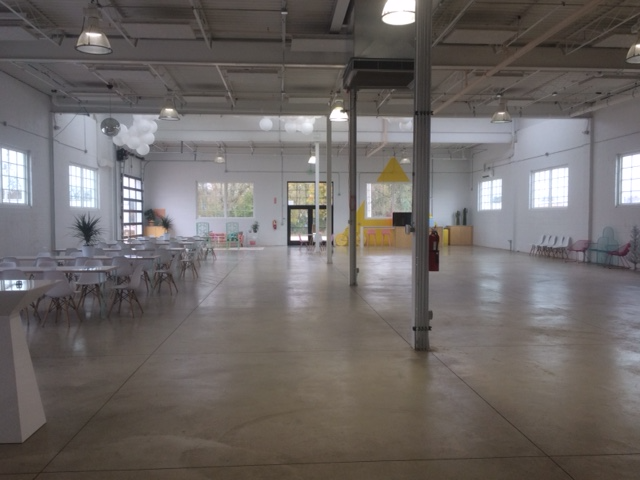 Since a picture is worth 1,000 words, we’ve included a few photos of the venue. There is ample parking (and free, incidentally) right next to the building. We’re hoping you’re as excited as we are to celebrate the Recovery Party at this new location. We will keep you posted on details as we draw closer to January 26, 2019. Enjoy celebrating Thanksgiving, Christmas, and the New Year first! Regularly scheduled KBC rides – on Monday and Wednesday evenings – for the 2018 riding season are a thing of the past. With the upcoming Fall time change on Sunday, Nov 4th, riding in the evenings means riding in the dark, and we’d rather not do that. Below are the folks who turned up for the final Monday Nite Ride for 2018. Great rides were had by all on a beautiful, clear and not too chilly fall evening. It has been a great riding season. We had 33 Monday Night Rides – one was officially cancelled due to thunderstorms – and 34 Wednesday Night Rides. If we had been keeping records, we would likely find that we had a record year for rider attendance – especially in the fall. We had several summer evenings with 90+ riders at the Monday Night Ride. And, many of us don’t remember ever seeing so many riders post-Labor Day on Monday nights, especially in October. Thank you to every cyclist who came out and rode with us, including the Tuesday Night and Friday Morning Women’s Rides. We extend an especially big thank you to everyone who served as a ride leader this year, again including the Tuesday and Friday Women’s Rides! Regularly scheduled KBC rides for 2019 will begin asap after March 10, 2019 (at 2 in the morning!) and, based on good authority, will be even more fun and satisfying than they were this year. So…weather permitting, the next Monday Nite Ride will be on March 11, 2019. And, Wednesday Nite Rides will recommence on Wednesday, March 13, 2019. Both regularly scheduled rides will continue through October 2019. Thank you all again for riding with us! We are already looking forward to next season. Now..take a break then get in shape for next year. Here https://gravelmap.com/#@42.4245487789684,-85.74318315429684,11,hybrid is a very cool link, brought to you by Steve Cox, via Doug Kirk, to more potential gravel routes than you could possibly imagine. So, next time you feel a hankerin’ for some groading, consult this map, ride the route you choose, record the route on your phone in Ride with GPS, and then send your route (if it’s a good one) to Dale Abbott (communications@kalamazoobicycleclub.org) for uploading to the KBC Routes Library on Ride with GPS. 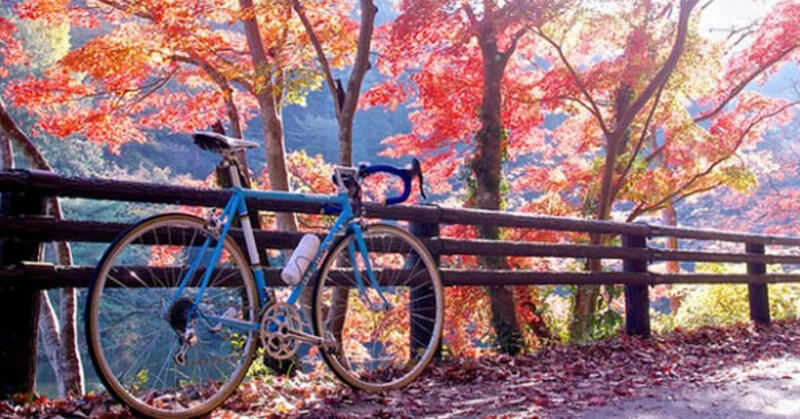 Forest Foliage in the Fall Ride, KBC’s annual self-supported and no-drop club ride to get out and enjoy fall colors, will take place on October 21st, rain or shine so dress for the weather. The rides – three routes of 34, 50, and 62 miles – will start at 10:30 am from the Gun Lake Park at 124th & Patterson (https://goo.gl/maps/m8Y6fB7LA652). Donuts and Cider are the prize for everyone at the end, back at Gun Lake Park. 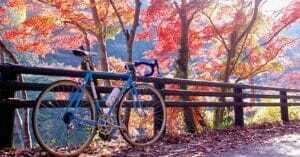 https://ridewithgps.com/events/67583-forest-foliage-in-the-fall-2018 You can also find links to the individual routes in the KBC Ride with GPS route library.